Birdstalking Part 2 or How the Catbird Sought Revenge..
I’m trying to come up with a better opening line that that. Tuckered out, you might say. Dog tired, bushwhacked, fatigued, lethargic, pooped even. There’s a catbird living in my tree. That’s right a catbird, I said. 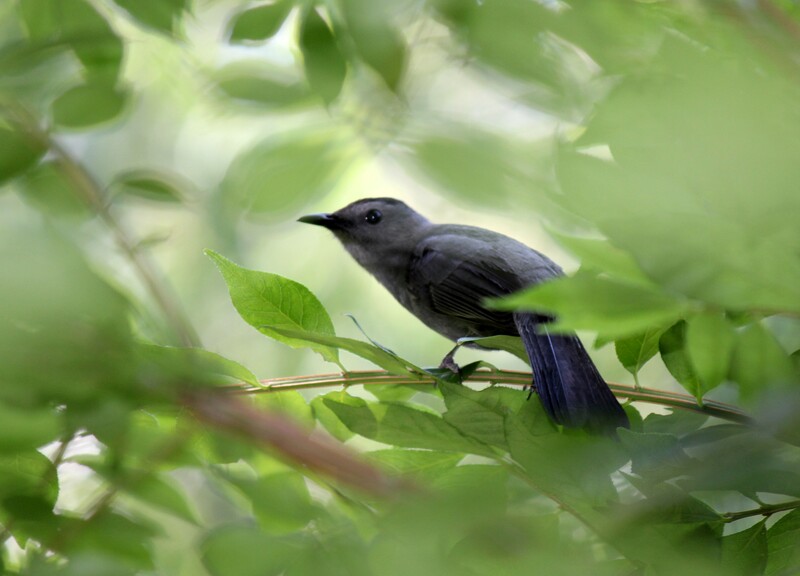 To be specific, a Grey Catbird, also known as the Slate Colored Mockingbird. 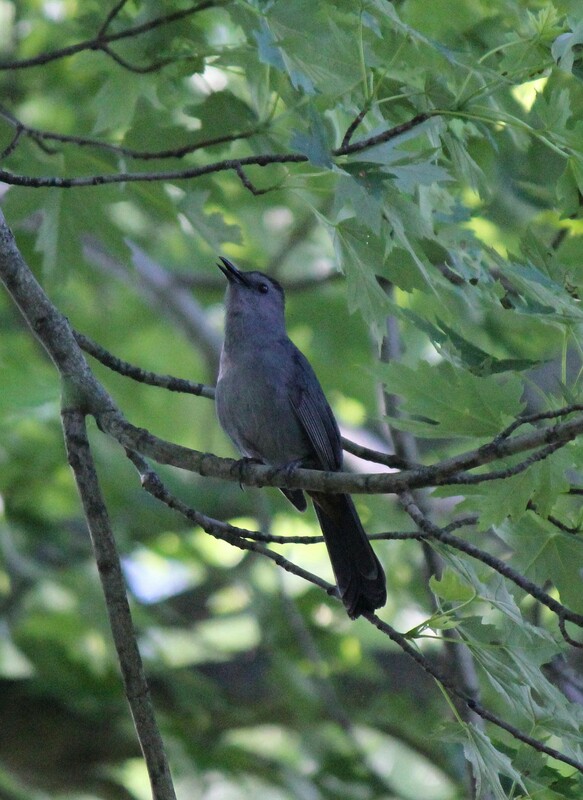 For those of who you have never met a catbird, yes, they do meow. They also cluck and cackle and caw. And they coo and cheep and twitter and peep. But the one thing they never do, the One Thing no catbird would ever dream of, the ONE THING that never ever, in the history of animal kind, a catbird has ever done is to.. They sing in the morning, they sing at night. They sing in the dark, they sing in the light. They sing when they’re hungry and happy and sad. 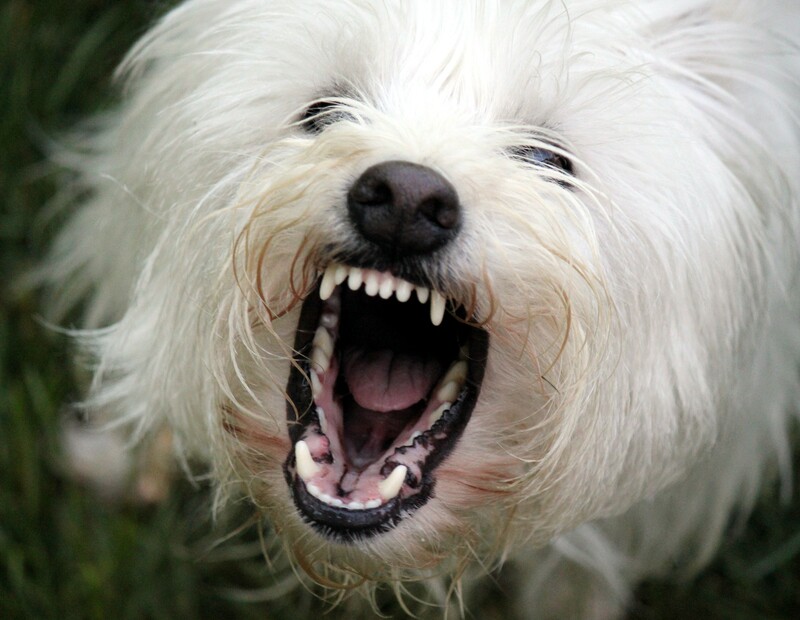 They sing when they’re excited, tense or mad! So I decided to fix his little red wagon and fry his chestnuts. He was done as dinner. I turned back to my bird stalking ways. I cleaned my camera lens and it was on.. I tried in vain to get a photo of him with his mouth shut. But I only managed to get photos of him with his mouth open. 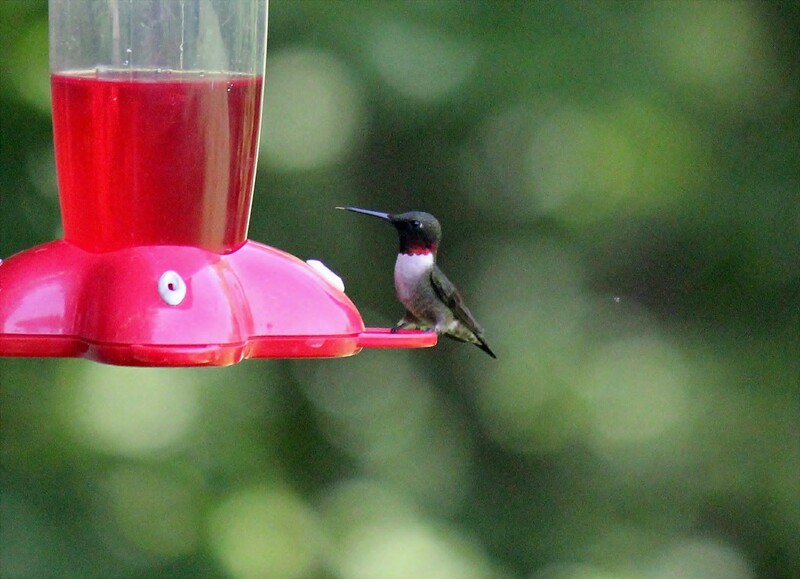 He was singing to the right..
Oh Mr Hummingbird, thank you for offering your services. Yes, you stick your tongue out at him. Oh dear, Mr Hummingbird. Yes it is awfully hard to mock a mockingbird. They enjoy it, the sickos. But thank you for trying. I appreciate the effort. Mr. Cardinal? You have an idea, you say? 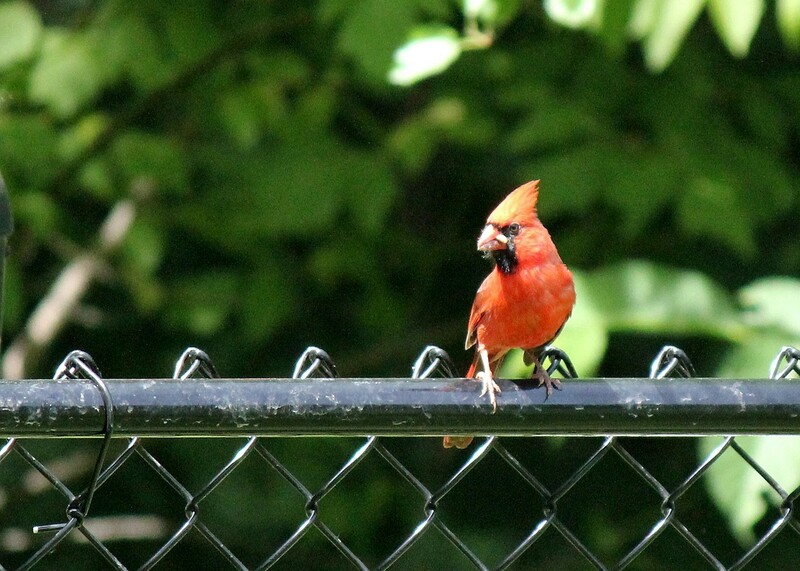 You’re going to give him the Awesomely Malevolent Evil Eye as only a Cardinal with a capitol ‘C’ can? Wonderful..Give it your best shot. Hmmm, Nice, but no banana. Mr Bluejay, You’re going to what!?! Screech it away? No!! No!! It’s a mockingbird!! For the love of God!!! Don’t teach it how to screech!! Sorry, beg your pardon, lost my composure for a minute. It really is mimicking you quite well. Yes that is how you sound, you can sit up in that tree and be as offended as you like but that is the noise that you make. You’re too busy playing ‘One Finch, Two Finch, Three Finch, Four!’ to help out a friend? Yes I do realize catbirds chase cats. And dogs. And hawks and sometimes people too. I also know that it’s been observed that other birds will actually line up and watch them when they are doing so. It’s true. Everyone loves a show. 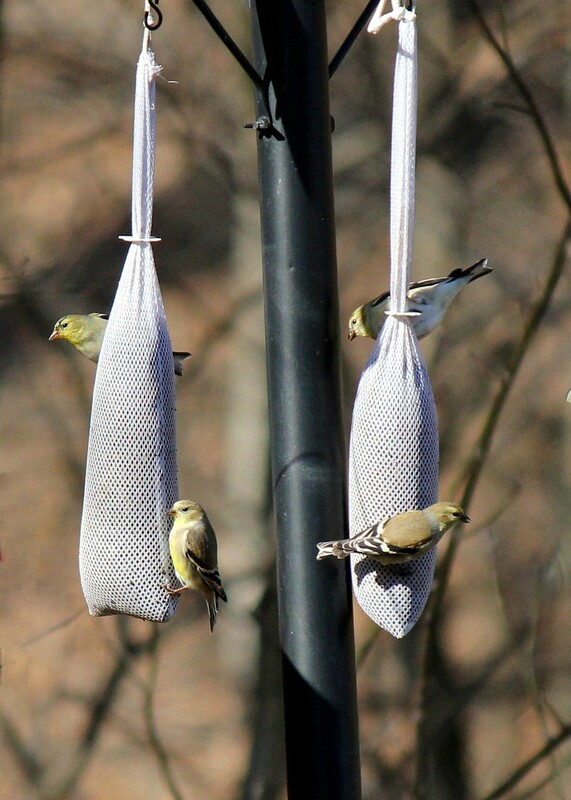 Fine, finches, go on with your game. I think I know what will do it. Well, I guess it’s time to ask the Honorable Zen Master Tree Frog for advice.. Hold up now. It’s upset you too? 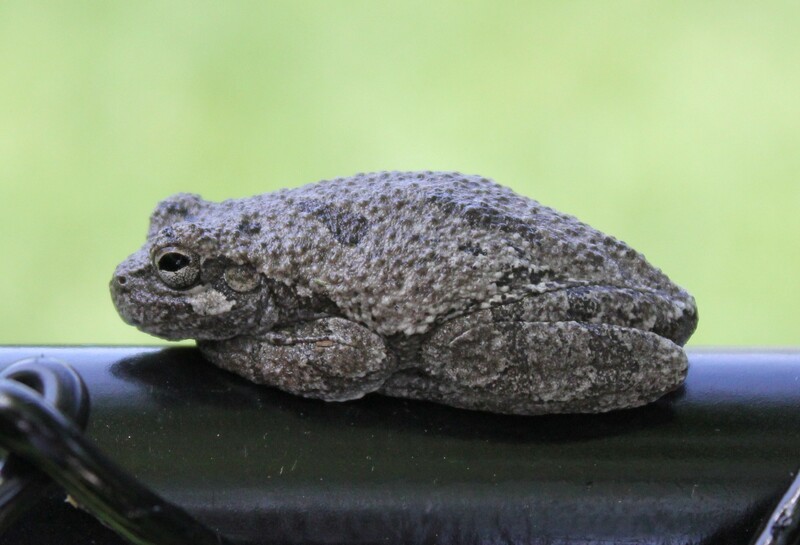 The Honorable Zen Master Tree Frog? The Catbird stole your moves? and your mating calls? The Nerve! The Gall! 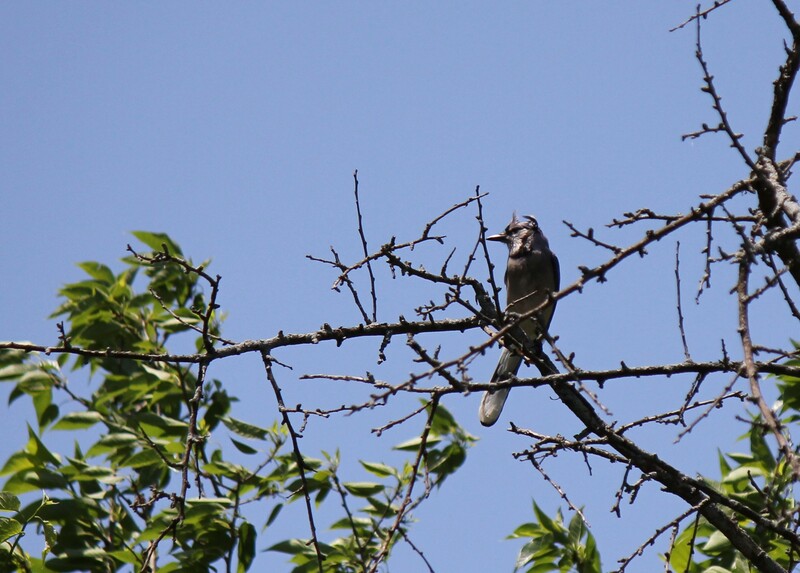 The sheer unadulterated insolence of that Grey Catbird slash Slate Colored Mockingbird! Dummy! Come quick! 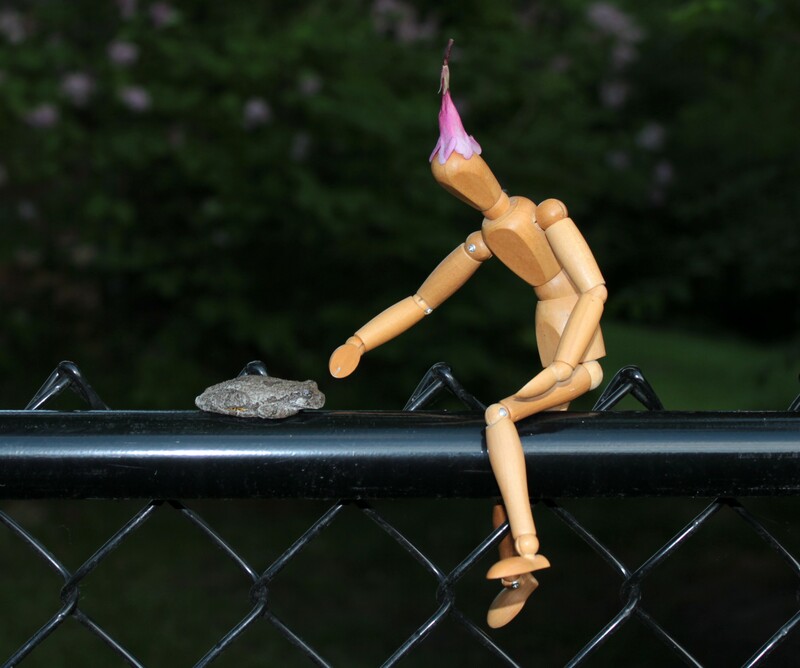 The Honorable Zen Master Tree Frog needs you! That’s a good Dummy, you cheer him up and I will settle this for once and for all. Catbird, I didn’t want to have to do this. You left me no choice. It shouldn’t have come to this but when you push people to extremes they go to…well..extremes. By the power invested in me as President, Vice President, Treasurer, Clerk, Recorder and Supporting Cast of Birdstalkers Anonymous (Quad Cities, IA/IL Chapter) I call the.. The (and this is the technical name).. 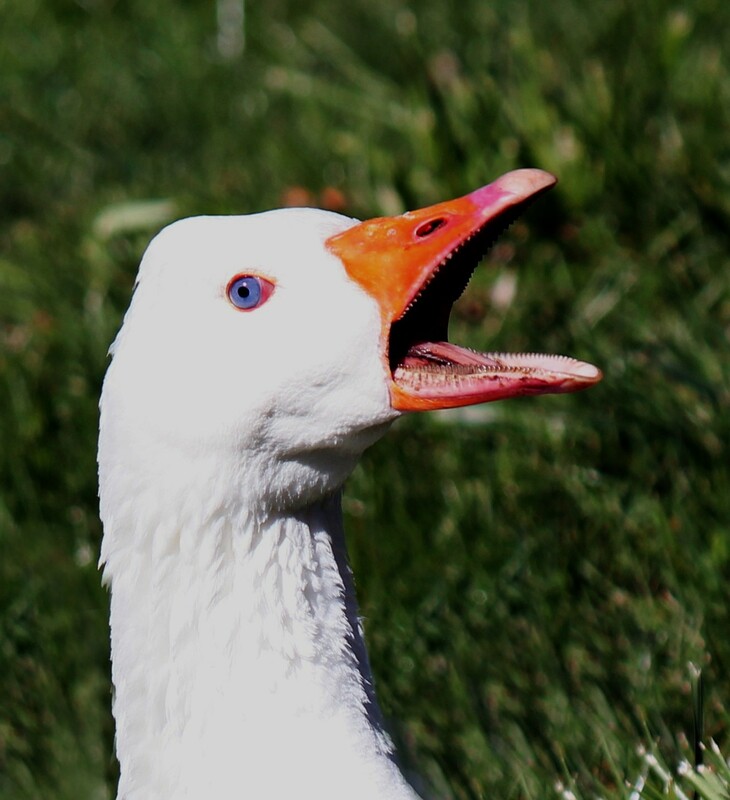 The Dastardly, Heinous, Ghastly, Loathsome, Menacing, Razor Toothed, Jagged Jawed, Mother Nature, that is one mean looking mother but it does have exceptionally pretty eyes for a goose Goose. We call him Al for short. So what do you have to say now Catbird? Wait a minute..What is that? Humidity? Oh it’s Hot! I guess it’s time to turn on the Central Air so my house doesn’t turn into an oven. You know when I turn on the Central Air so my house doesn’t turn into an oven, I can’t hear outside. Never mind, Catbird. Carry on. Now I have some peace, I can get back to painting. This is from a photo in Wetcanvas‘s RIL by Dave Slaughter. Thank you to him for it’s use. 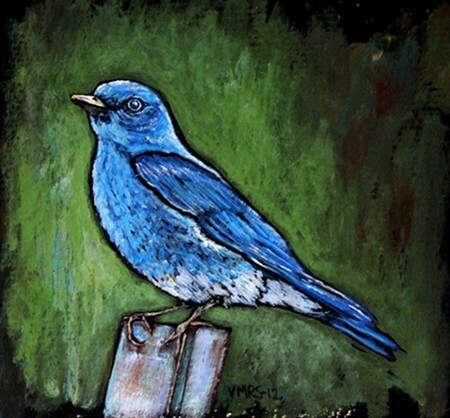 This is acrylic, 4×4 inches and it’s a Mountain Bluebird. Next > Meet me in Saint Louis, Louis..
You’ve got yourself one heck of a mystery going. 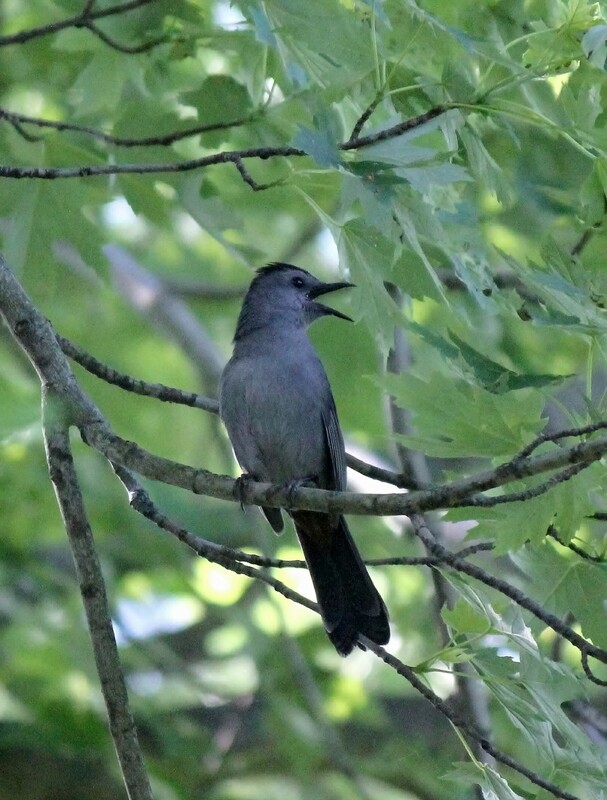 Must be downright frustrating that soon as your head hit the pillow, the catbird gets to calling. Similar to a toothache waking you up in the middle of night. Be nice to ole bird though. He can’t mean much harm. Just doing what catbirds do, I reckon. I was listening to him this morning and he’s added a new sort of squawk He had a really pretty run going then Squawk! It made me laugh. Drives me crazy but he is a clever bird. Sure sounds like it. And one with a sense of humor too. Thanks. 😀 The white goose one makes me laugh everytime I see it. So funny Virginia. I snorted my tea through my nose. I guess I shouldn’t eat breakfast and read your blog at the same time. A beautiful bird though. I’ll have to go on a bird website to actually hear what one sounds like before I feel sorry for you…crazy ol’ bat! Maybe you should show it the “castle” down the road. Lol, sorry about the tea. :D. I think he’s too young for the castle, lol. Okay I’m back. Sort of sounds like a blue jay. Maybe rereading “To Kill a Mockingbird” would make you feel better. Sarah said to name it Jabber Jay like in “The Hunger Games”. I love that book. They all sound a little different because they pick up more and more from the birds around them. This one can sing really pretty once in awhile.